Ash Body, Maple Neck and Much More! "You have the right to remain noiseless!" I wanted an autumn theme for this week's Friday Strat feature. So why not a Cherry Burst, along with a generous side helping of brick wall. Brooklyn based STREETSOUNDS-NYC currently lists the above Strat. And they want to emphasize they are indeed a brick and mortar outfit! If you're in the neighborhood there, stop in and say hi to Rocky. The current 2011 American Deluxe Strats are loaded with goodies like: contoured heel, locking tuners, "high mass" trem block and S1 switch. The 22 fret "C" profile neck is also a 9.5" - 14" compound radius. So where's the LSR nut? Well I guess they had to stop somewhere. "...The insulated metal core of each pickup position type differs in thickness and composition for enhanced tone, and Fender has fine-tuned the sized, shape, and wire gauge of the coils to balance the magnetic responsiveness essential to great tone..."
So do you think the typo with "sized" is intentional for B.S. liability reasons? 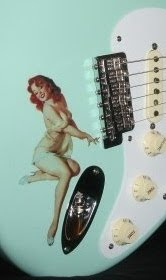 Okay, all kidding aside, the American Deluxe series offers lots of refinements in a production Strat. And the Cherry Burst Ash is a bluesy way to say, "It's friggin' November already!"